Electric guitar with T-style body shape from 1950's series that provides big tone and incredible versatility. With a double Rockfield SWC humbucker configuration, it provides a full array of classic tones often missing from a guitar of this style. 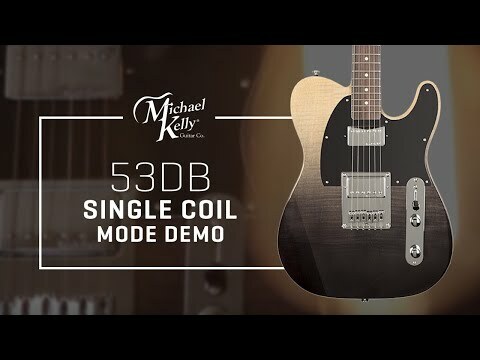 It also features Michael Kelly's custom electronics modification called the Great 8 allowing user to switch those humbuckers into a single-coil tone by two provided push-pull pots (Master Volume and Master Tone), providing a total of eight distinctive tonal options. The body of the instrument is made from alder and has a great looking flame maple top and natural wood stripe binding. The bolt-on maple neck features a modern "C" profile and a dual action truss rod. It is fitted with a rosewood fingerboard with 10.5" radius, 22 medium jumbo frets and dot inlays. Scale length is 647.7 mm, width of the bone nut fret is 43 mm. 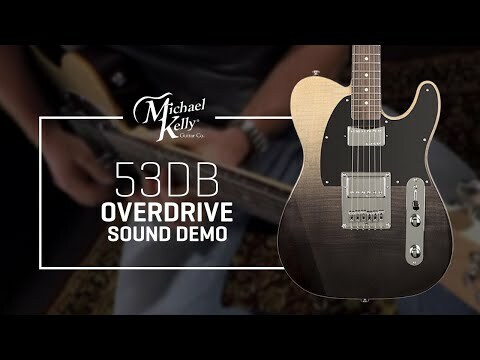 The guitar further features a 3-way blade switch, chrome hardware including MK die-cast tuners and T-style bridge, and D'Addario EXL110 strings (gauges: .010-.046). Dark Tiger's Eye colour design. Do you own Michael Kelly 53DB Dark Tiger's Eye or have you had a chance to try it? Nagyon jó mínőség, rendkívül kedvező áron! Köszönöm, és Jó ünnepet!